BEIJING, Oct. 8-- China has always backed a political solution to the Syrian crisis, and called for a new Geneva conference on Syria, Foreign Ministry spokesperson Hua Chunying said on Thursday. "We have noticed Russiasaid the military campaign is at the invitation of the Syrian government and aims to combat terrorism there," Hua said at a press briefing when asked if China backs Russia's air strikes against the Islamic State (IS) terrorists in Syria since Sept. 30. China has always believed a political solution is the best way to end the unrest in Syria, and it calls for an equal, inclusive and open political dialogue on the matter soon, she said. 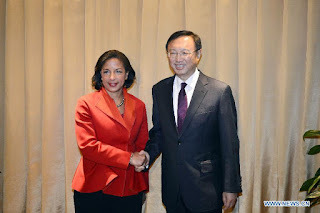 Specifically, China calls for a third UN-backed Geneva Conference on Syria, Hua said. The previous two were held in 2012 and 2014. BEIJING, Oct. 8-- Chinese State Councilor Yang Jiechi met here on Thursday with U.S. Deputy Secretary of State Antony Blinken, pledging to strengthen bilateral ties in the wake of President Xi Jinping's United Statesvisit last month. Yang said Xi and Barack Obamafurther confirmed the direction in which the China-U.S. relationship will develop, and that the two sides need to make joint efforts to implement their consensus. Blinken said Xi's U.S. visit demonstrated that China and the United States "could cooperate in a very meaningful way." The United States is ready to work with China to implement the consensus reached during Xi's visit to further bilateral relations, he added. From Oct. 5 to 10, Blinken is on an East Asia tour that has already taken him to Japanand the Republic of Korea.